UPDATE 2/19/19 – In the first calendar year of the Permanent Drug Take-Back Box program, residents safely disposed of 1008 pounds of unused, unwanted or expired prescription medications. 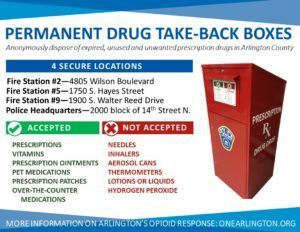 Due to the success of the program, an additional permanent drug take-back box has been installed at Arlington County Fire Station #5. 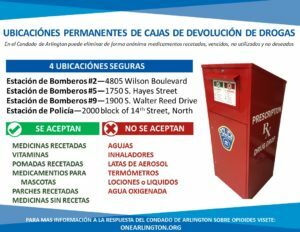 This expansion brings the total number of drop-off locations in Arlington County to four.